This pair of doves are adorable. The owner got them from a thrift shop but there's no mention of a make so far. Funny how our interests drift a bit based on things we encounter. It's like a wonderful journey of discovery (albeit a bit had on the pocket book sometimes ha ha). These are beautiful! I would love to find some like this. very cool but i need to hurry down to your previous posts something looks familiar to me! Looks like that partridge family bird. They are lovely! I have such a thing for ceramics too, bad when you live in a small flat! 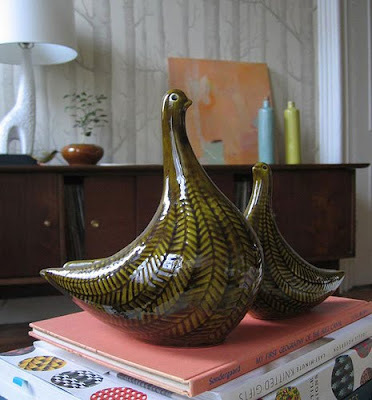 Do you like Jonathan Adler? Copyboy - I also thought it looked 'partridgy' but since I know next to nothing about birds I went with what the owner called them - doves.